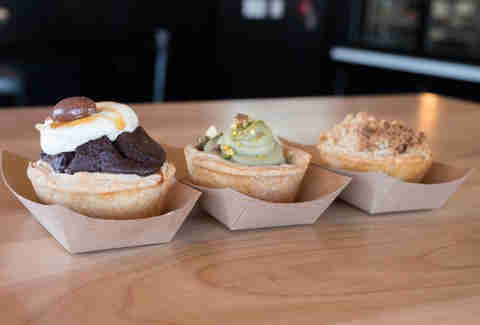 The recent opening of Pop Pie Co. is excellent news for the pie-starved populace of San Diego, whose options were previously few (and far-flung). 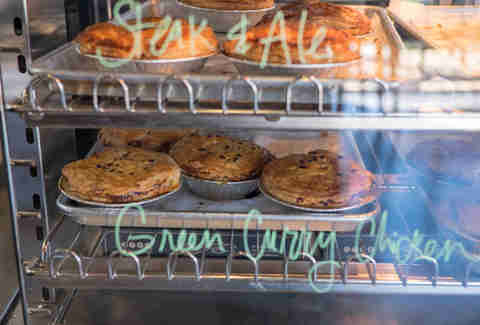 The shop’s vision is to produce traditional single-serving pies, both sweet and savory, with a twist, crafted from quality ingredients that deliver maximum returns on flavor. Seeing an opportunity to fill a void -- San Diego hasn't seen this kind of casual eatery before -- the duo searched for spaces in Little Italy, Barrio Logan, and North Park before deciding on the corner spot in University Heights, a former hair salon that required extensive renovations to accommodate their vision. The entire space was gutted and transformed into a “neighborhood gathering space” with communal tables, roll-up windows, and no outlets or Wi-Fi (a deliberate move to encourage conversation). 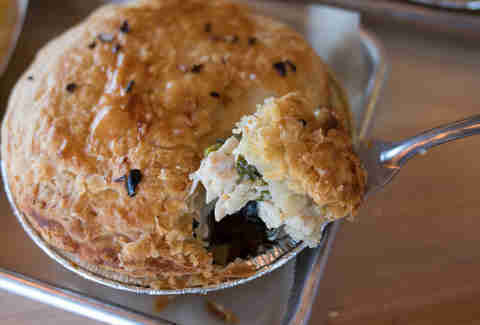 At Pop Pie Co., it’s always a short crust on the bottom and flaky puff pastry on top, both made with butter. Torres said they experimented with blending lard or shortening into the mix, but those experiments only proved butter is best. Under that flaky, buttery crust, there’s crunchy green beans, tender chicken breast, and a creamy coconut curry with aromas of Thai basil and lime leaf. It’s mildly spicy and so instantly addictive you’ll already be making plans to return for your next visit before your second bite. Torres says the pie is currently a seasonal special, but it’s so mind-bendingly delicious we’re hoping it stays on the menu in perpetuity. 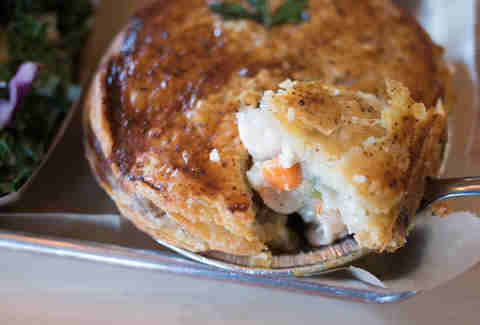 Like all of the pies, the green curry option is satisfying without being too heavy. As it turns out, that’s completely deliberate. Torres says the pies were designed that way so people can make them a regular part of their routine. “If you make something too heavy, people will only treat themselves once in awhile. We want our customers coming back,” he explains. Depending on your outlook, that could be a good thing -- who wants to choose between sweet or savory when you can have both? Current sweet offerings include salted caramel chocolate fudge, “Green Ceremony” (dark chocolate ganache topped with matcha green tea pastry cream and toasted pistachios), and apple crumble, made with Gala, Fuji, and Red Delicious varieties. In the ultimate bid to keep customers happy, Pop Pie Co. offers craft brews on tap (and pie-pairing suggestions!) along with a comprehensive selection of coffee beverages, like pour-overs, cold brew, and flavored lattes made from beans sourced from a variety of local roasters, including James Coffee Co. and Bird Rock. 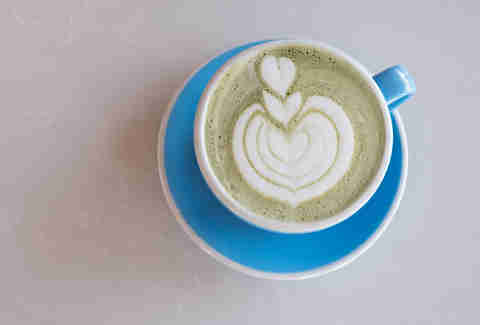 They also feature beans from a different West Coast-based roaster each month. 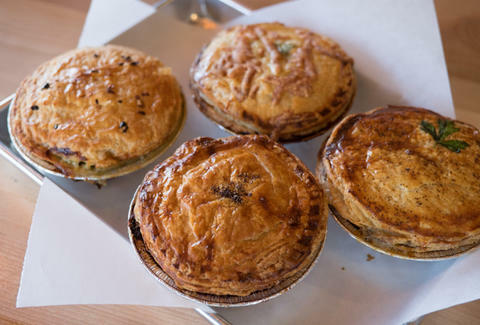 It’s a bit too early to predict Pop Pie Co.’s future, but given that it’s been such a smash hit right out of the gate, it’s possible another location could open elsewhere -- think of Crack Shack or Carnitas Snack Shack. Torres says he’s certainly open to the idea. For now, your best bet is to visit early (ideally between 11am and 2pm) for the best selection of pies before it inevitably runs out. Pop Pie Co. is open Tuesday - Sunday, 7am - 7pm.